This year there was a cultural shift that saw landscape architecture and its practitioners achieve an unprecedented level of visibility and influence. This year the single most notable development came courtesy of the New York Times architecture Michael Kimmelman critic who wrote: "Great public places and works of landscape architecture deserve to be treated like great buildings." Landscape architecture and architecture on equal footing. Let that sink in. 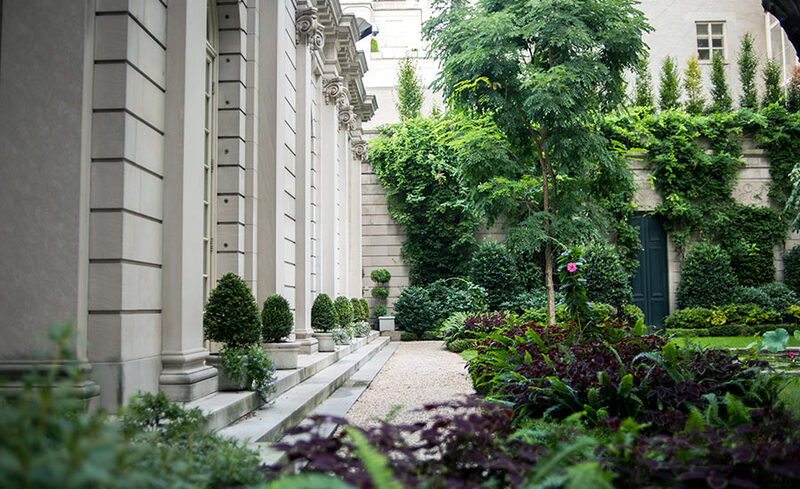 East 70th Street Garden at The Frick Collection designed by Russell Page. Photograph © 2014 Navid Baraty, courtesy The Cultural Landscape Foundation. Kimmelman was writing about another notable development, the expansion plans at New York's Frick Collection, which would destroy its elegant Russell Page-designed viewing garden. When the plans were first announced in June, the garden was at best a peripheral concern. Now, as a recent New York Times article points out, it's the focal point; and the coalition Unite to Save the Frick has lined up numerous organizations, prestigious individuals and collected thousands of signatures all in opposition - among them, Robert AM Stern, architect and dean of the Yale University School of Architecture, who said: "Gardens are works of art." Fortunately, enlightened rather than endangered accounts for the remaining notable developments - well, almost. Buffalo Bayou Park. Photograph by Jonnu Singleton/SWA Group. In Houston, TX, 2014 marks the climax of two decades of activity spurred by the 1995 Olin Master Plan for Hermann Park. Long known as the city without zoning, Houston has turned a corner - by engaging many of the nation's leading landscape architects, the city's patrons and stewards are showing a deep commitment and belief in the power of transforming the civic realm through the design, construction and renewal of parks and the creation of connected green spaces. The roster of practitioners and projects is impressive: Design Workshop and Reed Hilderbrand at the Houston Arboretum and Nature Center, Nelson Byrd Woltz at Memorial Park, Michael Van Valkenburgh at the Menil Collection, SWA at Buffalo Bayou Park, Hoerr Schaudt at Centennial Gardens in Hermann Park, and Hargreaves Associates at Discovery Green. Forty years ago the great critic Ada Louise Huxtable wrote: "Houston is the place where money, power, and patronage are coming together in a city of singular excitement ... If Houston has found the formula for turning prosperity and growth into beauty and elegance, it is indeed the city of the future." 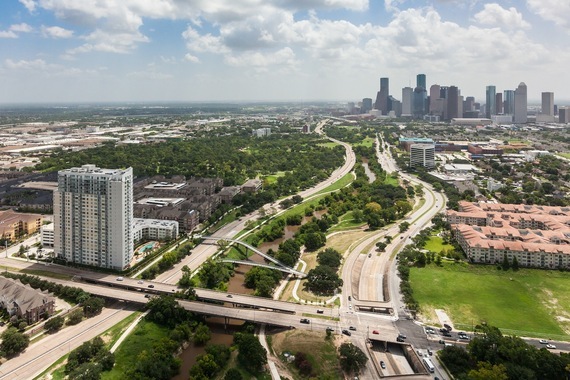 Thanks to national design talent, visionary political leadership and successful public-private partnerships, Houston is transforming from the City of Petroleum to the City of Parks. Inspired urban transformations in Atlanta, GA and Queens, NY also deserve attention. In the vein of Rails to Trails and the High Line, which have recreated abandoned railroad lines, the BeltLine, as the New York Times reported, is transforming "22 miles of vine-covered railroad into parks, housing and public transit around Atlanta," linking 45 neighborhoods in the process. In addition, "It would add 40 percent more parks to Atlanta. Only 4.6 percent of Atlanta is parkland, compared with 25 percent in New Orleans and 19 percent in New York." Last month, thanks to an $18 million TIGER V grant from the US Department of Transportation, ground was broken on the West Side Trail, a new three-mile section. Hunter's Point South Waterfront Park. Photograph © Wade Zimmerman, courtesy Thomas Balsley Associates. Also last month, Hunter's Point South Waterfront Park in Queens, NY, a project by Thomas Balsley Associates and architects WEISS/MANFREDI with ARUP as the prime consultant and infrastructure designer, received an Honor Award from the American Society of Landscape Architects (ASLA). 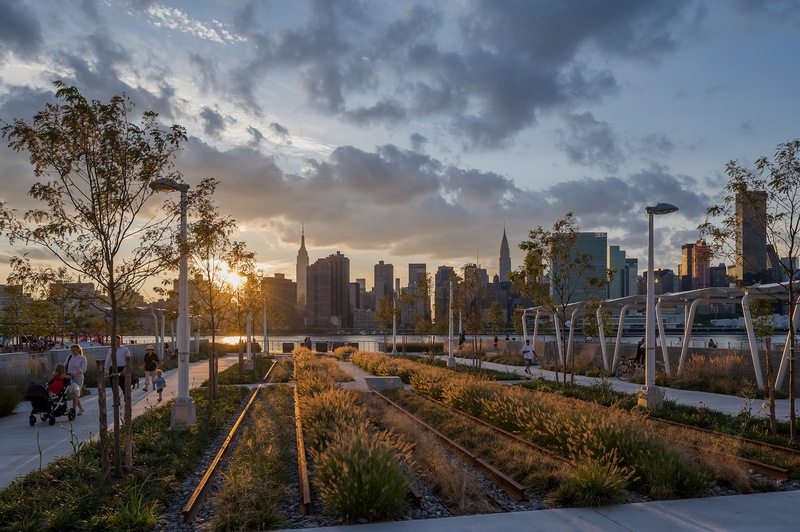 The 5.5-acre park, which faces midtown Manhattan, is the first phase of a larger development that will transform a 30-acre, previously abandoned post-industrial area on the East River into a site with 5,000 housing units, recreation area and a public school. The park, a new model of urban ecology and a laboratory for innovative sustainable design, has been built to last - while under construction it was flooded by Hurricane Sandy, but its drainage system functioned exactly as planned. Mellon Square. Photograph © Richard Schiavoni, courtesy The Pittsburgh Parks Conservancy. Modernism got a big boost. Mellon Square in Pittsburgh, PA, the first park over a parking garage, reopened following an extensive restoration by the Pittsburgh Parks Conservancy and Heritage Landscapes, as detailed in Susan Rademacher's new book Mellon Square: Discovering a Modern Masterpiece. 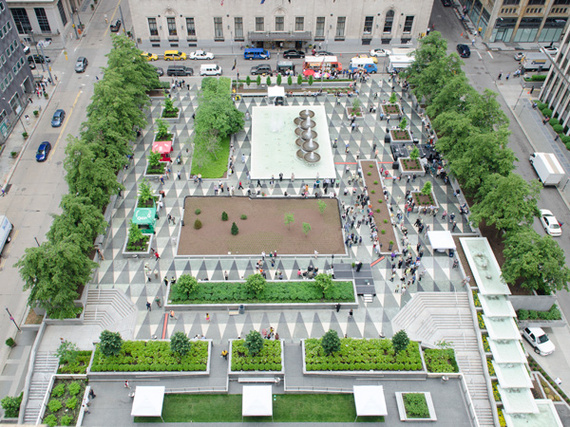 Designed by landscape architect John O. Simonds, of Simonds and Simonds, in collaboration with architect James Ritchey, of Mitchell and Ritchey, the plaza - called a "[M]odernist jewel" by the Pittsburgh Post Gazette's Marylynne Pitz - was paid for by the Mellon family foundations and conceived as an oasis, a gathering space in the midst of dense corporate buildings. The Thomas Church-designed General Motors Technical Center in Warren, MI, Church's only know collaboration with architect Eero Saarinen, joined an elite group when it was declared a National Historic Landmark. Design reviewers hold great sway over aesthetic decisions, no more so than at the Commission of Fine Arts, an independent federal agency that reviews "design and aesthetics" of construction within Washington, DC. For the past two years, the presidentially appointed seven-person commission has included Elizabeth Meyer, the University of Virginia's dean of the school of architecture and a professor of landscape architecture. In 2014 two landscape architects, Mia Lehrer and Liza Gilbert, filled two vacancies at the commission - a historic event as it's the first time landscape architects, let alone three women landscape architects, have served as commissioners at the same time. The Commission oversees development on such iconic places as the National Mall, so participation by these thoughtful and considerate professionals is extremely important. Cover: Connecticut garden designed by Richard Hartlage. An orb of steel agricultural disks rests among Rudbeckia fulgida var. deamii. Photograph by Rob Cardillo, courtesy Garden Design Magazine. 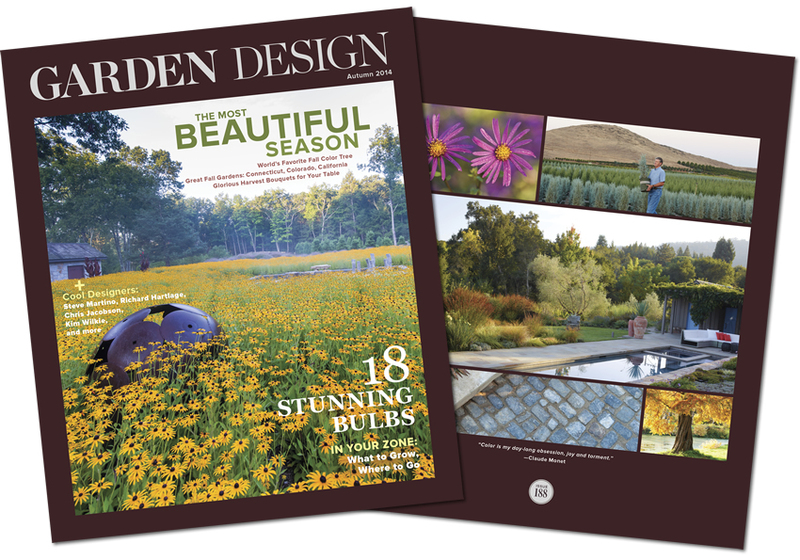 Garden Design Magazine, long a staple for informative stories and great photography, has been resurrected by publisher Jim Petersen. The new, advertising free quarterly, continues the magazine's tradition with gusto under the direction of editor in chief Thad Orr. Finally, this year saw the passing of two exceptional people who deserve to be much better know. Conrad Hamerman, a selfless Modernist designer, devoted the greater part of his career to bringing his friend and colleague, Roberto Burle Marx, to the forefront of landscape architecture in the US. Although the bulk of Hamerman's career focused on teaching and mentoring, he also completed a significant body of built work including his own magical garden in Philadelphia, which is worthy of preservation. 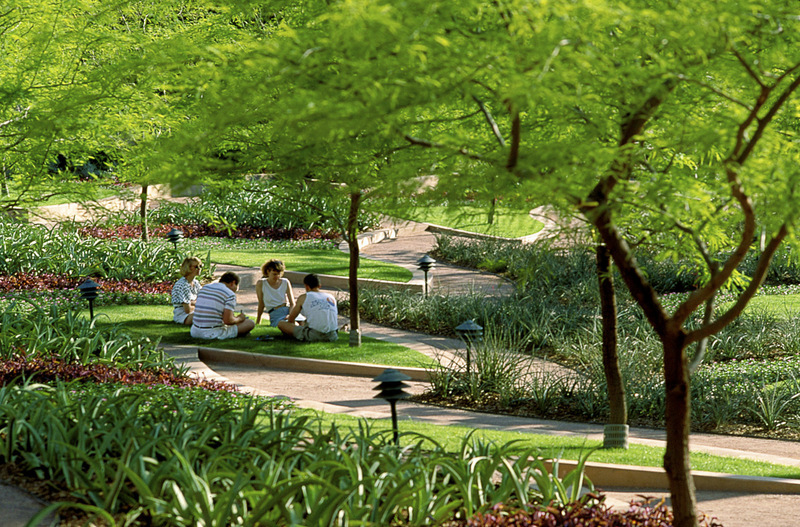 People resting on the parterre under mesquites trees at Arizona Center in Phoenix, a project by Bill Callaway. Photograph by Dixi Carrillo/SWA Group. William Callaway, known as Bill, who spent his 45-year career at SWA (originally known as Sasaki Walker Associates), was considered an "icon of post-World War II design" by Peter Walker, one of the field's most influential practitioners and educators. A statement issued by SWA said: "Bill's enormous talent and dedication produced impactful landscape architecture projects throughout the United States and internationally." Bill's inspiring and estimable legacy, which includes important Postmodernist projects, is worthy of emulation. As I put the finishing touches on this article, the following appeared in the Chicago Tribune: "Final push for Obama library bids ahead of Thursday deadline." Among the sites being considered for the presidential library are two historic parks - Washington and Jackson - designed by Frederick Law Olmsted, Sr. and Calvert Vaux, of Central Park fame. This comes on the heels of recently announced plans to build, what Chicago Tribune architecture critic Blair Kamin calls, George Lucas' "ridiculously overscaled mountain of a museum along Lake Michigan." For all of the progress we can cite with statements like the one from Mr. Kimmelman, we still have to deal with retrograde thinking that views parks as dumping grounds and places to put "stuff."